This bespoke shower enclosure is a project we recently completed for in Prior Lake, MN for Key Land Homes. You’ll notice how charmingly the frameless glass plays off of the rustic character of the tilework. An operable transom was included over the door to allow for venting since this is a steam shower, and the bathroom fan is located outside the enclosure. The transom piece operates simply by pivoting on its center hinges. Without proper venting, a steam shower could invite mold and mildew buildup (yuck), so we want to get the moist air out of there efficiently. Obviously, while a person is showering and wanting to enjoy a steam, just the opposite is true – the water vapor needs to build up and remain trapped inside. Vinyl gaskets are ran between the seams to help achieve this by blocking air flow. As you can tell from the photo, the gaskets blend into the glass nicely in order to maintain the clean look of the frameless enclosure. Frameless shower hinges typically swing 180-degrees, but on steam showers we use what’s called an L-seal (because of it’s L-shaped, imagine that…) which prevents the glass shower door from swinging in. This provides the tightest and strongest seal for the handle side of the door. One last feature worth noting is the bench included at the rear of the shower. 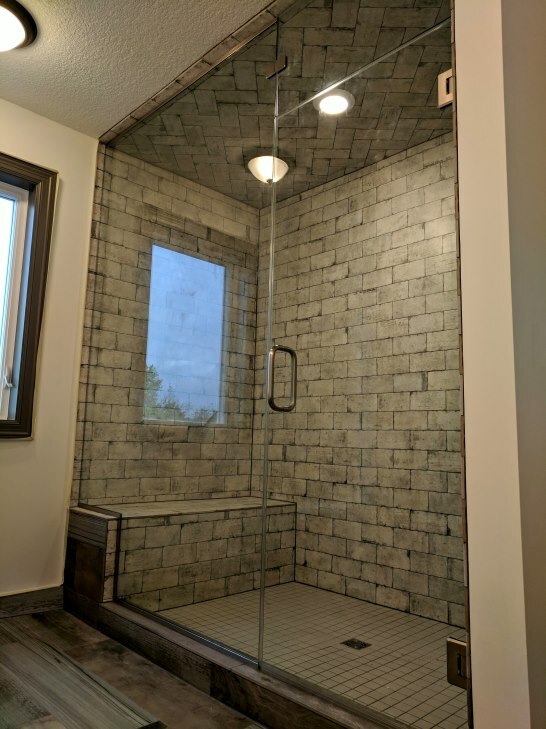 This is a great addition to a steam shower in that it allows a homeowner to sit down, relax and enjoy their shower like they would a steam room. A notched glass panel was fabricated to accommodate the shape of the bench. For this shower u-channel (3/4″ profile) was used to secure the notched panel along the ceiling and the base. No channel is required along the wall since the panel extends to the ceiling, with top and bottom channel providing ample support. Clear silicone is run along this seam to prevent seepage. The handle and hinges are pretty standard. The handle is a solid brass 8″ back-to-back pull style handle. 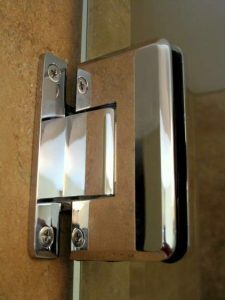 Simple and elegant, its the most common handle on the market. These heavy duty hinges are also made of solid brass. With radius corners and a beveled edge the pair nicely with the gentle curve of the handle.